Today’s episode is about a dawr, unusual because of its rhythm. Usually, dawr are composed to 4-pulse’ rhythms: the madhhab of a dawr, as described in books, is to the 8-pulse’ maṣmūdī and the dawr is ‘ala al-waḥda. Sometimes, in the tarannum and responsorial section between the munshid and the biṭāna, i.e. the henk, there are some differences in the rhythm, such as the use of the duwayk and the maqsūm that are also 4-pulse’ rhythms. Today, we will start a series of episodes about dawr that do not follow this system, and we will launch this series with dawr “El-ḥelū lammā in‘aṭaf”. Dawr “El-ḥelū lammā in‘aṭaf” was written by Ismā‘īl Bāshā Ṣabrī, the muḥāfiẓ of Alexandria under Khedive Ismā‘īl and later, and a major public figure of Egypt’s modern History, as well as a great poet both in the Egyptian colloquial language and literary Arabic. Dawr “El-ḥelū lammā in‘aṭaf” was composed by ‘Abduh Afandī al-Ḥāmūlī whose name along with his colleague’s Muḥammad ‘Uthmān are linked to the establishing of the Nahḍa school. It was composed by Al-Ḥāmūlī to the 3-pulse’ dārij rhythm “dum iss tak tak tak iss dum iss tak tak tak iss” and to the muḥayyar maqām, a dūkāh or bayyātī sub-maqām. It starts with the jawāb then drops to a surprising qafla at the qarār i.e. the dūkāh. It was named muḥayyar because it focuses on the muḥayyar scale that is the dīwān of the dūkāh scale. Aside from these details, I think this episode is different from all the others because we will listen to a complete dawr at first. Moreover, we have 7 recordings of the dawr to analyse. There are numerous recordings of this dawr, made over different periods. The first recording is of Sheikh Aḥmad Ḥasanayn, made between 1903-1904 by Odeon on one side of a 27cm record. 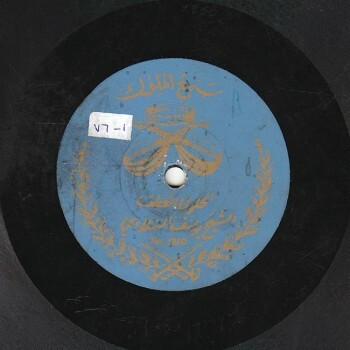 The second recording is of Sheikh Yūsuf al-Manyalāwī, made in 1905 by Sama‘ al-Mulūk –German record company Bekka– on two sides of a 27cm record. 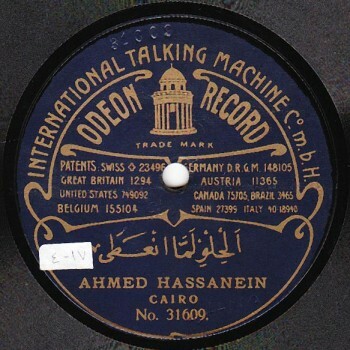 The third recording is of ‘Abd al-Ḥayy Afandī Ḥilmī, made in 1906 by Odeon on two sides of a 27cm record. 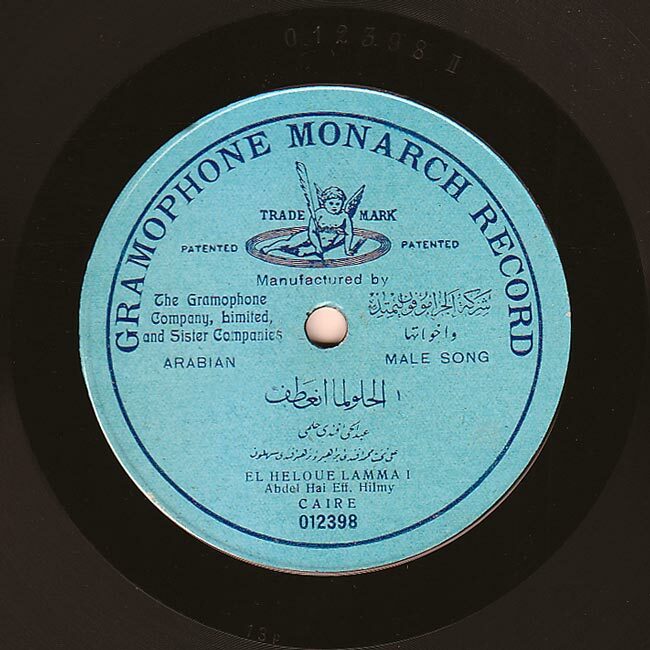 The fourth recording is also of ‘Abd al-Ḥayy Afandī Ḥilmī, made in 1908 by Gramophone on two sides of a 30cm record. The fifth recording is of Sheikh Yūsuf al-Manyalāwī, made in 1909 on two sides of a 30cm Gramophone Concert Record. The sixth is a tape recording –a rarity at AMAR– of Kārim Maḥmūd at the Egyptian Radio. The sound type implies that it was made around the late 1940’s or early 1950’s, I think. The seventh recording is of Sayyida Saniyya Safar ‘Alī in a special jalsa, made in the late 1950’s or early 1960’s –I think– at the home of Safar Bēk ‘Alī on a reel from Mr. ‘Abd al-‘Azīz al-‘Anānī’s reel library now owned by AMAR. Let us start our analysis with the complete dawr in a recording where the dawr is “malmūm” (rounded) (according to the Egyptian expression). So here is Sheikh Aḥmad Ḥasanayn singing an abridged version of the dawr, recorded in 1903: madhhab “El-ḥelū lammā in‘aṭaf” followed directly by the second dawr “El-ḥubb ḥāluh ‘agab” that concluded the disc or the dawr. Let us listen to the complete dawr at first then start our analysis. We forgot to say that he was accompanied by ‘Abd al-‘Azīz Afandī al-Qabbānī (qānūn) and Ḥāj Sayyid al-Suwaysī (‘ūd). Let us now start our analysis. The dawr’s madhhab consists of 4 parts to the muḥayyar pattern as mentioned in books. I do not think this was done on purpose since ‘Abduh al-Ḥāmūlī fully acted upon his instinct. He started “El-ḥelū lammā in‘aṭaf” to the muḥayyar from the top then dropped to the rāst aspect at the nawa scale. In “Akhgal gamī‘ el-ghuṣūn”, he used the ‘ushshāq at the nawa. Then, in “El-khadd ammā in’aṭaf”, he used the kurdī jawāb to affirm the ‘ushshāq aspect at the nawa before dropping to the dūkāh at the maqām’s position/place in “Warduh bi-ghēr el-‘uyūn”. It resembles the music pattern followed by Jamīl Bēk al-Ṭambūrī in the samā‘ī muḥayyar that we know, even though the dawr certainly existed before Jamīl Bēk al-Ṭambūrī’s samā‘ī muḥayyar. Still, instinct played a significant role in the close musical traditions of Egypt, the Levant, and Turkey. Let us listen to the madhhab performed by Sheikh Yūsuf al-Manyalāwī and note the display of the maqām. ‘Abd al-Ḥayy Ḥilmī was always very fond of breaking the rules. Let us listen to the madhhab where he “breaks” the dārij rhythm, disorients the band and the percussionist, and has them follow him at times then at times follows them. Let us listen to ‘Abd al-Ḥayy Ḥilmī’s interpretation of the madhhab recorded by Gramophone. They followed each other in turn. Let us now check out the interpretation of this music forty years after these recordings, and listen to the madhhab of this dawr performed by Kārim Maḥmūd in the recording we mentioned at the beginning of our episode. Note how he sings. Note for example the difference in the vocal and instrumental interpretations between ‘Abd al-Ḥayy Ḥilmī’s and Kārim Maḥmūd’s performances, between Sheikh Yūsuf al-Manyalāwī’s and Kārim Maḥmūd’s performances, and between Sheikh Aḥmad Ḥasanayn’s and Kārim Maḥmūd’s performances: the singing did not change a lot, unlike the instrumental interpretation: the way the instrumentalists dealt with their instrument changed more than the vocal interpretation did. Let us listen to the madhhab performed by Kārim Maḥmūd and compare it to the previous one. Let us now go to the dawr. It seems that the dawr was performed in full during concerts, i.e. with the 3 dawr. Yet, Kārim Maḥmūd only performed the second dawr “El-ḥubb ḥāluh ‘agab” in his recording. But it seems that the old muṭrib performed the 3 dawr, or maybe performed a different one in each concert. We have recordings where 2 dawr are performed: a dawr used for the tafrīd and another dawr for the khātima. Sheikh Yūsuf al-Manyalāwī for example recites directly the 3rd dawr “Yā-llī bulīt bi-el-hawa” in his Sama‘ al-Mulūk recording, while in his Gramophone recording, he performed “We-ruḥt ashūf lī sabab”. In both recordings, he concluded with the dawr he chose: in his Sama‘ al-Mulūk recording, he concluded with “Ḥatta yihūn el-‘asīr”; in his Gramophone recording, he concluded with “Bi‘īd we-ṣa‘b el-marām”. ‘Abd al-Ḥayy Ḥilmī, in both his recordings, performed the tafrīd in “El-ḥubb ḥāluh ‘agab” and concluded with the 3rd dawr “Yā-llī bulīt bi-el-hawa”. He did not sing “We-ruḥt ashūf lī sabab” at all. We may never know about the live performances of the 19th and early 20th century classical Arabic musical traditions. There are no sources to tell us how these dawr were performed live and, of course, we do not have recordings except for those of Ṣāliḥ ‘Abd al-Ḥayy, etc… that are only microphone performances, and long as they may be, they do not include the audience or the listeners and thus do not reflect live performances. Let us forget about this issue now and start with Sheikh Yūsuf. Abū Ḥajjāj’s tafrīd is behaved in Sama‘ al-Mulūk’s recording, unlike his impish tafrīd in Gramophone’s, even though he was 4 years older… he may have felt that recording had improved, I do not know… yet his tafrīd is impish. Let us listen to dawr “Yā-llī bulīt bi-el-hawa” that he chose for the tafrīd in Sama‘ al-Mulūk’s recording, then listen to its equivalent, dawr “ruḥt ashūf lī sabab” in Gramophone’s recording made 4 years later. There is an extremely beautiful phrase by ‘Abd al-Ḥayy that he does not repeat in the two records in our possession. It seems to roam inside his head though during the tafrīd, even if he performs his tafrīd in a different dawr in the two recordings: once in “El-ḥubb ḥāluh ‘agab”, and once in “Yā-llī bulīt bi-el-hawa”. Let us listen to this phrase and note how he roams around a melody that was fixed in his mind. Both Sheikh Yūsuf and ‘Abd al-Ḥayy Afandī Ḥilmī do not go outside the maqām. Whether Sheikh or Afandī, they both remained within the muḥayyar pattern and did not shift completely to another maqām, even if Sheikh Yūsuf performed impish tafrīd and ‘Abd al-Ḥayy remained within the 5 notes as usual, segmenting them “and tearing us apart along with them”. We will get back to this because we have not finished our analysis. But let us now go to the qafla because we are going to present two recordings at the end of the episode and resume in our next episode. Sheikh Yūsuf’s qafla is simply a repetition of the dawr’s melody with different lyrics. The dawr he chose to segment the lyrics is the same in both recordings. Let us listen to the qafla in Sama‘ al-Mulūk’s recording…. The melody is the same, yet segmented to different dawr. 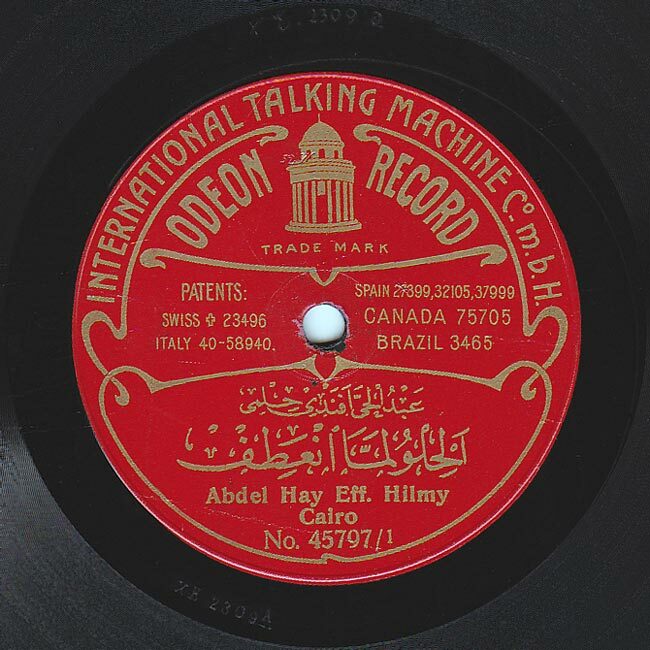 While ‘Abd al-Ḥayy Ḥilmī segments the same melody to one dawr: in his Odeon recording for example, he keeps the rhythm. I honestly neither know nor understand why he kept this specific rhythm; in his Gramophone recording, he segmented the melodic weave differently. It is of course the same melody but the way he segments it in Odeon’s recording and in Gramophone’s is different. I do not know if this improvisation was prepared or on-the-spot. Let us listen to the part before Kārim Maḥmūd’s qafla and note how he went to a completely different part –we will discuss this in our next episode– then concluded. Aḥmad Ḥasanayn’s khātima –recorded earlier– is very strange: he seems to be in the middle of a tafrīd improvisation then goes straight to the khātima. Let us listen to this conclusion, even if we have already listened to the dawr, and focus on how he suddenly decided to go directly from improvising to singing the khātima. Have you noticed? He may have realised that the disc’s duration was ending… I do not know… it is a strange type of khātima. Old music theory books state that one must go back to the madhhab. Let us study some examples, such as dawr “El-alb dāb is‘ifīnī yā ‘ēn” also composed by ‘Abduh al-Ḥāmūlī performed by ‘Abd al-Ḥayy Ḥilmī who goes back to the madhhab. In a later recording, Sayyida Saniyya Safar ‘Alī, –apparently a singing amateur, a subject we will discuss in detail in a future episode– goes back to the dawr’s madhhab in her khātima. Let us listen to Saniyya Safar ‘Alī’s khātima and note how she goes back to the madhhab. In any case, she went back to the madhhab a lot throughout her interpretation. Let us now listen to a complete recording of the dawr performed by ‘Abd al-Ḥayy Afandī Ḥilmī and made around 1906 by Odeon. ‘Abd al-Ḥayy Afandī Ḥilmī is accompanied by Ibrāhīm Sahlūn (violin), Muḥammad Ibrāhīm (qānūn), and an unknown percussionist. 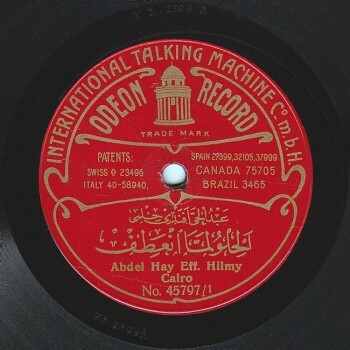 The record starts with a dūlāb to the muḥayyar maqām –I can’t understand why someone cut it in the middle saying: “Odeon records”– then ‘Abd al-Ḥayy Ḥilmī follows the dūlāb with layālī to the muḥayyar maqām as usual, but with a few scales, and concludes suddenly. Ibrāhīm Sahlūn plays a violin taqsīma, followed by dawr “El-ḥelū lammā in‘aṭaf”. At the end of the dawr, he sings layālī to the bamb. By the way, these are his first layālī where he displays the maqām following the Turkish system, i.e. he keeps a high note, stays at the jawāb then concludes suddenly. 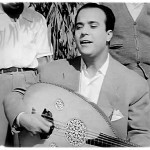 More than the Turkish influence, the reason is probably that he did not like to sing to more than 4 or 5 notes at most. Since he had to conclude at the qarār, he dropped and did. Then Ibrāhīm Sahlūn plays a violin taqsīma to the bamb to the same rhythm of the layālī that he sang. Then he goes back to singing layālī followed by a brilliant taqsīma played by Muḥammad Ibrāhīm to the bamb that concluded the record. Let us listen to ‘Abd al-Ḥayy Ḥilmī singing “El-ḥelū lammā in‘aṭaf”. Let us end our episode with Sheikh Yūsuf al-Manyalāwī (Abū Ḥajjāj). 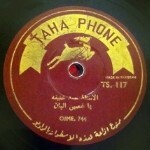 The recording was made in 1909 by Gramophone. It starts with the same dūlāb muḥayyar performed in ‘Abd al-Ḥayy Ḥilmī’s recording. We forgot to mention that this dūlāb seems to be excerpted from an instrumental piece by Ibrāhīm Sahlūn’s takht called “Bulbul el-afrāḥ” and played to the 9 beat aqsāq, not the 4/4 beat. It seems to have changed at a certain point in time into a dūlāb (when they are about to sing something to the muḥayyar). The dūlāb is followed by layālī to the bamb and pleasant taqsīm played by Muḥammad al-‘Aqqād. Sheikh Yūsuf, like Al-‘Aqqād, displays the maqām then sings the dawr, and ends its halfway through the second record-side. Muḥammad al-‘Aqqād fills the remaining long duration with a relatively extended taqsīma to the muḥayyar maqām and at the same time performs the qafla to the shūrī as if he were going back to the ṭāhir, a bayyātī sub-maqām. Then Sheikh Yūsuf goes back to singing layālī and we can hear pleasant taqsīm –from the few ones played by ‘Abduh Ṣāliḥ on the nāy– then the qafla to the muḥayyar in the ṭāhir manner. As for promising Sāmī al-Shawwā who had recently arrived from Aleppo and was playing for the first time with Sheikh Yūsuf, he performed the taqsīm to the ṭāhir from the beginning, not to the muḥayyar. Let us listen to this recording. By the way, the taqsīma played by Sāmī al-Shawwā predicts his future success and stardom. Let us listen to Sheikh Yūsuf al-Manyalāwī accompanied by Muḥammad al-‘Aqqād (qānūn), Sāmī al-Shawwā (violin), ‘Alī ‘Abduh Ṣāliḥ (nāy), and Muḥammad Abu Kāmil al-Raqqāq (percussions), and the biṭāna with Ḥasan Yūsuf al-Manyalāwī and ‘Alī ‘Abd al-Bārī. We will meet again in a new episode to resume our discussion about dawr “El-ḥelū lammā in‘aṭaf”. “Sama‘ ” is a show that discusses our musical heritage through comparison and analysis, and is brought to you by Mustafa Said.